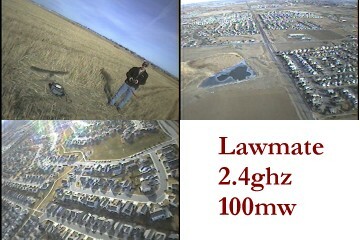 This was from the first flight of my Lawmate 2.4ghz 100mw system. The results were very good with the stock dipole on the receiver and groundplane on the transmitter. Image clarify was excellent, and dropouts were minimal. This is the second flight of the Lawmate unit, and my first attempt at a photo montage :-) For this video I've hacked in a patch antenna on the receiver and flew it as high as I could, which wasn't the highest I could go but the gusty winds prevented me from doing a true altitude test. Gliding high and turbulent landing. I took my Lawmate transmitter out for a spin on a clear but cool day recently and was just tooling around over the road that borders my flying field. This transmitter/receiver set is available from www.BlackWidowAV.com.